Good morning Clemson Girls! We are halfway through the week and that much closer to the weekend! Speaking of the weekend, who is going shopping this weekend and taking advantage of the many Spring sales out there? If you live in the Upstate, make sure you make a stop in downtown Clemson at Tickled Orange. They have a great special going on with popular brand Boy Meets Girl University®. Their stylish tanks and tees are on-trend and would be super cute paired with shorts, a maxi skirt, or even over your bathing suit. Print this coupon below to get 15% off of your Boy Meets Girl University® purchase AND receive a FREE tote bag (while supplies last). Boy Meets Girl USA® has generously offered to give one very lucky Clemson Girl one of their very own Boy Meets Girl University® tanks. Use the widget below to enter.... Your emails will not be shared with anyone or used for any other reason other to contact you if you win. Deadline for entries is Midnight EST tonight, April 17. We will draw a winner at random tomorrow and contact them by email. The winner will have 48 hours to reply or we will draw a new winner. 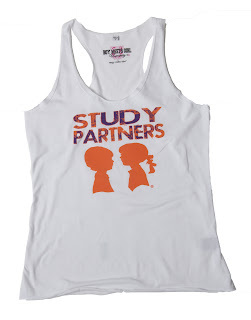 Special Clemson Girl thanks to Boy Meets Girl USA® for sponsoring today's fabulous giveaway! Make sure you get to Tickled Orange before the end of April to take advantage of their special offer.